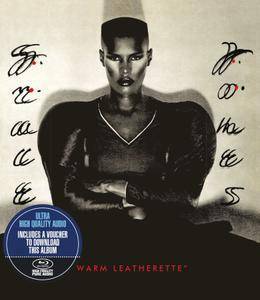 Grace Jones released Warm Leatherette in 1980, greeting the new decade with an updated sound after a streak of disco hits in the 1970s. Produced by Sly and Robbie and other cutting edge producers, the album finds Jones covering Roxy Music, Smokey Robinson, Tom Petty and more in a musical hybrid described as a blend of rock, reggae and new wave. The Pretenders cover Private Life was a UK top 20 song for Jones, one of her most successful British singles. Grace Jones fans have been well served by Universal Music in recent years with an excellent Nightclubbing reissue in 2014 and last year's Disco box set which brought together Portfolio, Fame, and Muse in one smart package. This trend continues in 2016 with deluxe editions of Jones' 1980 album "Warm Leatherette", her first album in her critically-lauded "Compass Point Trilogy" saw Jones working with an all-star session group (rhythm section Sly Dunbar and Robbie Shakespeare, plus percussionist Uziah Thompson, along with keyboardist Wally Badarou, and guitarists Mikey Chung and Barry Reynolds) and leave '70s disco well behind. Tracks "09-32" is bonus tracks on this Blu-Ray edition.